Oh, and the cat logo on the car has red eyes. Fiat Chrysler announced the Hellcat Redeye today, as part of the “most powerful SRT Hellcat lineup ever” that’s driven by the engine from the 840-HP Dodge Challenger SRT Demon. The Demon only lived for the 2018 model year, but its features are quickly trickling down the Dodge lineup. That includes the base Challenger Hellcat, which will get a factory-rated 717 HP and 656 lb-ft of torque—up from the typical 707 HP figure of the Hellcat name, a number already so high that FCA gives customers a 500-HP key fob to tone it down. The Hellcat Redeye will keep the 707 figure in the form of lb-ft of torque. The Hellcat Redeye will have a 6.2-liter supercharged Hemi V8 under the hood, and an eight-speed automatic transmission. The regular Hellcat will keep the option for a six-speed manual transmission, and both will come in widebody versions. The widebody and regular of the Redeye will top out at 203 mph, while the Hellcat will be able to get to 199 mph and the Hellcat Widebody is capped at 195 mph, according to Dodge. Above are their claimed quarter-mile speeds, according to FCA. 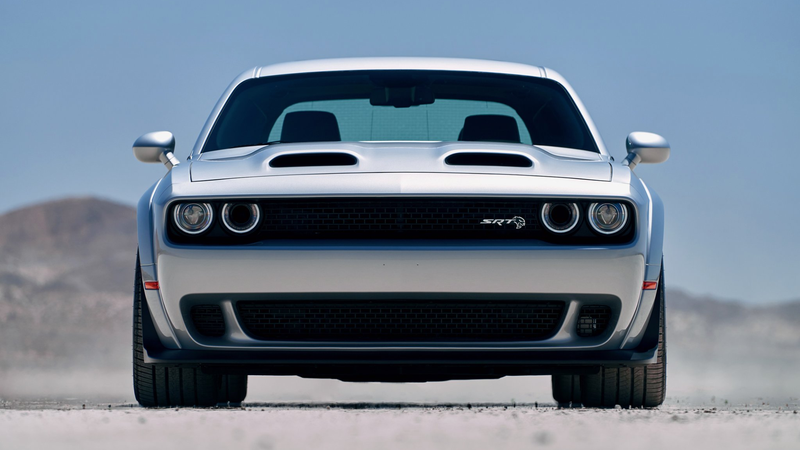 Dodge has also given the Redeye the more than two dozen component upgrades that the Demon got, including on the engine. In comparison to the regular Hellcat, the Redeye engine will have: a supercharger upgrade from 2.4 to 2.7 liters, an increase in boost pressure from 11.6 to 14.5 psi, a higher RPM limit of 6,500 versus 6,200, as well as upgrades to the fuel pump and air-intake system. The 2019 Dodge Challenger performance lineup. Dodge teased the new Hellcat with dual snorkels in early May, and more room for air to get under the hood made us wonder whether the car would get a power boost. The Redeye power figure puts that boost at nearly 100 HP, as the Hellcat lineup continues to creep closer and closer to those Demon numbers. We all knew Dodge couldn’t stay quiet—or toned down—for long.